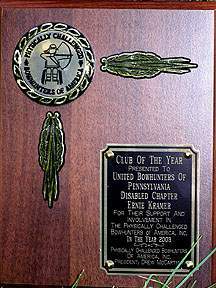 The Physically Challenged Bowhunters of America has chosen the UBP Disabled Hunters Program as their club of the year for 2003. The award was presented to the UBP Disabled Hunters Program "for their support and involvement in the PCBA in the year 2003." We are honored to receive this award and thank you to everyone who supports the UBP DHP. Without your support we would not have received this award. Ernie Kramer � Chairman, Gary Wessner � Vice Chairman & Auction Hunts Coordinator, Brian Heffner � Selection Committee Chairman & Disabled Hunts Coordinator, David Firek � Financial Manager, George Tague � Website Coordinator, Todd Gehringer � IT Manager, Media Manager & Banquet Registration, Jolene Schlegel � Committee Historian & Banquet Registration, Eddie Schlegel III, Carolyn Kramer, Tim Racine, Dave Bausch, Jamie Lovens � Banquet Auctioneer, Lee Kitson, and Brian Fiddler. 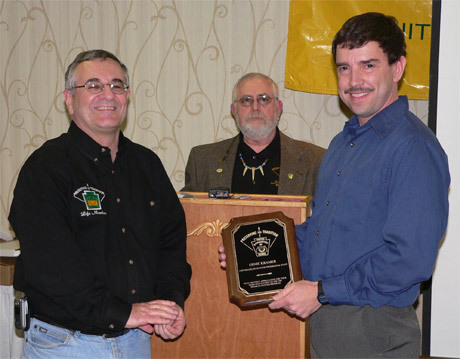 UBP President Wes Waldron (center) presented the DHP Committee with their award at the 2007 Banquet. Left to right: UBP Vice President Buck Appel, President Wes Waldron, and DHP Committee Chair Ernie Kramer. Ernie accepted the Committees' award plaque.